Pity most butterflies, who spend most of their lives as a worm-like larvae and relatively inanimate pupa. Once they emerge and display their bold colors and delicate form, most have only a few weeks of life left. They spend this brief time flying around, sipping nectar or fruit juices and looking for mates. Butterflies are naturally short-lived, but bad weather, predators, pesticides and disease can shorten their already brief lives even more. Butterflies undergo complete metamorphosis, meaning they pass through four different life stages. All butterflies start life living in a small egg; soon after this, they hatch into larvae, commonly called caterpillars. The caterpillars eat the leaves and stems of plants, and once they have consumed enough food, they enter the pupa stage of their life cycle. During the pupal stage, the caterpillar spins a silken retreat in which to metamorphose into an adult. Some moths form a cocoon -- made of leaves and silk -- on the outside of their chrysalis, but butterflies do not. After completing their development, they emerge from their chrysalis as an adult butterfly. Caterpillar eggs often hatch after a few days. In temperate areas, eggs deposited late in the season may overwinter; the larvae hatch and begin feeding in the spring. However, in the perpetually warm tropics, this winter dormancy is not required. The longest living species have a two-year life cycle; however, the majority of this occurs when the butterfly is in the pupal stage of development. The vast majority of butterflies live only a week or two at the longest. However, two types of butterflies are exceptions to this rule: temperate species that have a winter-dormancy and some tropical species. 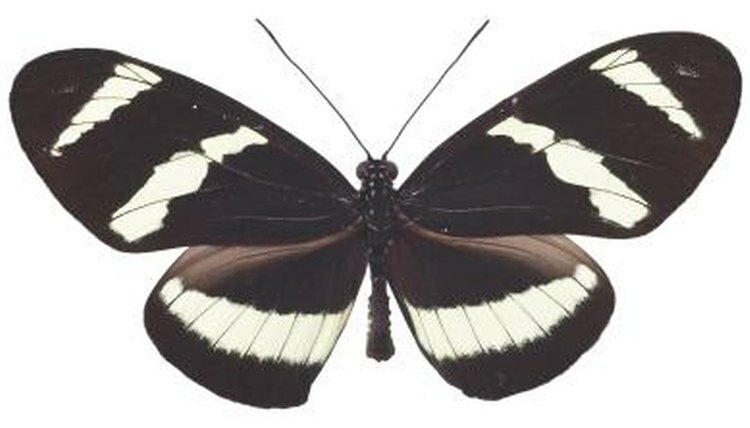 Tropical butterflies of the genus Heliconius may live for six months. Additionally, butterflies of the family Ithominae, the genera Morpho and Battus each live for several months as well. In general, larger butterflies tend to live longer lives than smaller butterflies. The location of a butterflies and the time of year they hatch also influence their lifespans. Because temperatures, food availability and the presence of parasites vary across the range of many species, some areas may produce butterflies that live twice as long as others do. Monarch butterflies have many generations per year, and some generations have longer lifespans than others. The migratory generation -- which migrates from the temperate North America to the tropics -- is longer lived than the early generations. Predators feast on a great number of butterflies. Birds are perhaps the most important predators of adult -- and larval -- butterflies, but lizards, frogs, spiders and praying mantises also consume butterflies when they can catch them. Inclement weather can damage the large, delicate wings of butterflies. Though butterflies can fly with extremely damaged wings, eventually rain and high winds can harm their wings enough to prevent them from functioning. Once deprived of their wings, butterflies become easy prey. Even if the butterflies’ wings survive high winds, they may be blown far off course, and they may not be able to survive in their new habitat. TheButterflySite.com: How Long Do Butterflies Live?